Dell PERC H730P Integrated RAID Controller 2GB NV CacheThe PERC H730P Integrated RAID Controller from Dell offers reliability and performance in addition to providing management with the tolerant disk subsystem failures. This RAID controller offers expandable 2GB storage capacity to improve the performance of your server systems. The double module channel provides high-speed connectivity. This product has been tested and validated on Dell systems to ensure compatibility with your computer. It is supported by Dell Technical Support when used with a Dell system. The PERC H730P Integrated RAID Controller from Dell offers reliability and performance in addition to providing management with the tolerant disk subsystem failures. 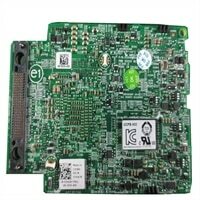 This RAID controller offers expandable 2GB storage capacity to improve the performance of your server systems. The double module channel provides high-speed connectivity. This product has been tested and validated on Dell systems to ensure compatibility with your computer. It is supported by Dell Technical Support when used with a Dell system.